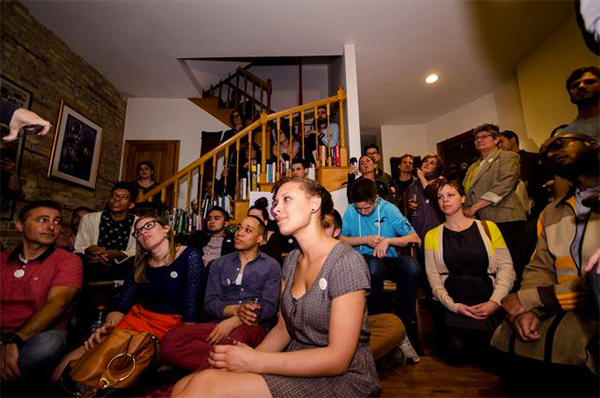 The Chicago Home Theater Festival brings Chicagoans out of their neighborhoods and into each others’ homes to experience hyperlocal performance and radical generosity. The Chicago Home Theater Festival redefines who art is for, who art is by, and where it all takes place by transforming homes throughout Chicago into venues for original and experimental performance, cinema, and interdisciplinary art. Founded in Berkeley, California in 2010 and currently spanning 3 continents and 10 countries, the International Home Theater Festival launched in Chicago in May 2013. The inaugural year featured performances in 13 homes by over 100 artists throughout the north, west, and south sides of the city. Intentionally extra-institutional, the festival explores the private domain as public forum for risk-taking, radical generosity and interdisciplinary collaboration.